Harry Bright became a Rotarian in 1987 under the sponsorship of Jack and Robert Ruger. 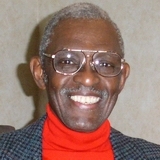 Harry served as President in 1993-94 and is a Paul Harris Fellow. Shortly after becoming a member, Harry led and still leads the singing of the National Anthem and the song welcoming our visitors. Harry has been an advocate for our annual Scholarship distribution to include Music Awards. He has also contributed his own money to make it happen. Harry was born in Washington DC. He received his formal education in Winston-Salem, which was spiced with a strong dose of music, a tradition in the Bright household. He studied the violin in high school and was concert master in his high school orchestra. He attended Howard University and after two years transferred on an athletic scholarship to Seton Hall University where he earned a BS in Education. He received an MA in Comparative International Education from New York University. He served in the United States army and was a member of the All Army and All Service track teams, winning the 440 yard hurdle and as a member of the 4x00 yard championship relay team. Harry competed in International competitions in Europe, Asia and Africa. Harry became a voice student at the Westchester Conservatory of Music and joined the New Westchester Symphony Orchestra as a violinist. Professionally, Harry has worked in Cambodia where he trained local teachers in Physical Education Methodology. While in Cambodia, he wrote a book entitled, “Track and Field for Beginners,” the first sports book to be translated in the Cambodian language. It also had a French translation and was used in the French speaking countries of Africa, where he also worked. Harry has been employed by the New York City Board of Education, Mount Vernon Public Schools, The National Conference of Christians and Jews, Eastman Chemical Products, and the White Plains Commission on Human Rights, from where he retired in 1991. He was elected to the White Plains Common Council in 1975, the first Black to hold that position. He has served on many boards, including as Chairman of the United Way of Westchester. Notably, he is the recipient of many awards. An avid golfer, Harry is married to the former Rebecca (Becky) Waller. They are the parents of two, David and Miriam. Here is a 5-minute video of a presentation Harry gave at out club meeting on April 23, 2013. It was a motivational speech to the WPHS athletes at our "Loucks Track Meet" meeting on that day. This is a really good speech.